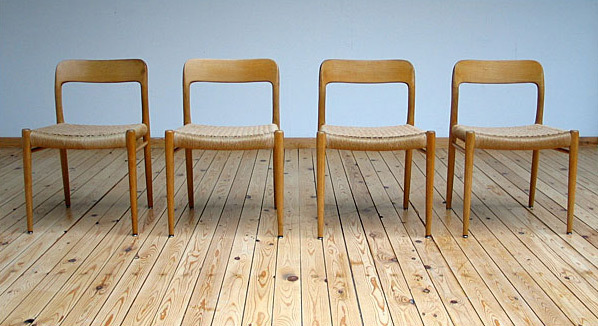 Set of 4 Scandinavian dinning - room chairs. With original seating in woven paper cord. Organic shaped back. Marked 'JL MOLLER MODELS, MADE IN DENMARK'. Constructed of solid wood, comfort along with clean mid century lines. Set de 4 chaises salle a manger Scandinave avec une ligne moderne organique. Siège originale en corde de papier. Marque 'JL MOLLER MODELS, MADE IN DENMARK'.